At a recent reading in Los Angeles, Brent Armendinger spoke of fragmentation as a way of saying the unsayable. We know all too well that language often fails us when we need it most; it can’t contain our deepest emotions. 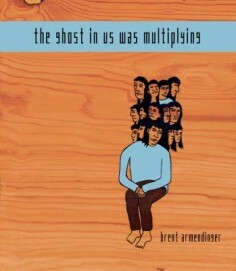 Rather than ignoring or avoiding the problems of language, Armendinger’s debut full-length collection The Ghost In Us Was Multiplying foregrounds them: such vexed language—fragmented, faltering, insufficient, and all we have—becomes the way in which the poet accesses the inaccessible. He was alive and he didn’t pay his fare and he ran and he was only 19 and No. there is no say entirely. got on the bus. 10 times in the back. can’t fire a shot like the one that No. They say it was he it was the boy who. “The police say”—but the speaker understands that it doesn’t really matter what they say. The speaker turns to etymology, looking to the history of the word “victim” to make some sense of this tragedy. Yet he immediately recognizes the failure of that project: to call someone a “victim” merely obscures the fact that “he had and has and they a name.” The speaker then turns back to the present, back to the police, who say that “their guns / can’t fire a shot like the one that” and who insist that “it was he it was the boy who”—but again, the only possible response is No. or a them. A who. Caliber. and when are they going to fall. Reaching the last stanza, we have to reconsider how the metaphors have been used. They have not merely broken down. Rather, they have been broken apart so that they can be recombined in this chilling whirl. Language is “stuck inside” the wires the speaker-as-utility-pole helps support. He understands that he is implicated in all this violence and that soon—though we cannot know when—the wires and all the voices they hold must collapse. fetal as hope inside a camera. with wet eyes and underwear. in our body like a clock. ticking like a dance routine. Drawing in an allusion to The Scarlet Letter, the poem continues to resist literal sense-making. Instead, it works to give us the feeling of the feeling, without allowing us to comprehend the situation fully. It shows us suffering, stigma, the sense of weight, the sense that the present is at once like the past and worse. Like the speaker of the poem, we’re thrust into intense emotion and denied even the cold comfort of understanding. This entry was posted in Uncategorized and tagged Summer 2015 on July 21, 2015 by Kelly.